"Between August 8 and 10, 2018, the sanitary sewer discharge action level [100 µg/L] was exceeded [max. 30-fold] due to apparent building 27 effluent influences, in combination with baseline groundwater infiltration exacerbated by a significant precipitation event on August 8." In Fig. 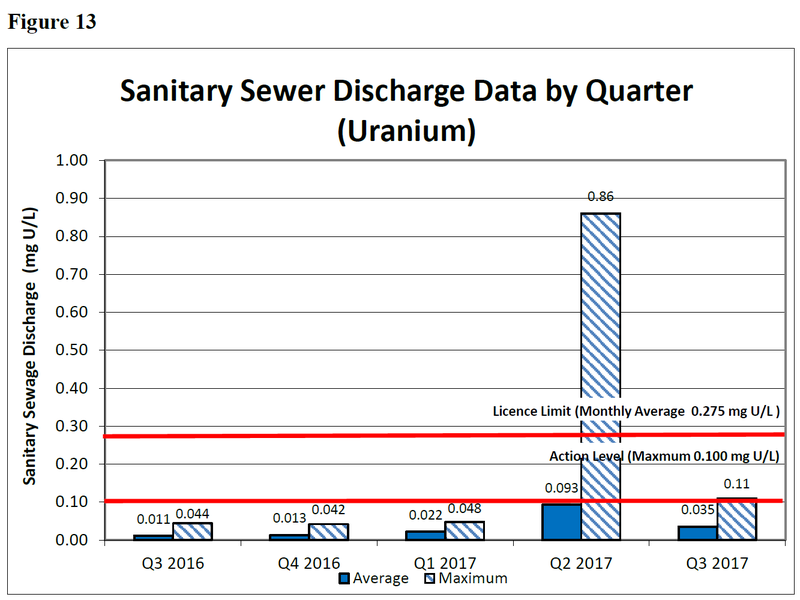 13 of its compliance report for the second quarter of 2017, Cameco concealed a massive exceeding of the action limit for the uranium concentration in the sanitary sewer discharge at its Port Hope conversion plant by drawing the lines indicating the Action Level and the Licence Limit at 10 times their actual values, thus making the monitoring data seemingly to comply. In the report for the subsequent quarter, the lines are shown at their correct places, revealing the massive exceeding of the action value for the Q2 quarter. The Canadian Nuclear Safety Commission (CNSC) will hold a public hearing (Nov. 8-9, 2016) to consider an application from Cameco Corporation (Cameco) to renew, for a period of 10 years, its Nuclear Fuel Facility Operating Licence for the Port Hope Conversion Facility located in Port Hope, ON. The current licence expires February 28, 2017. Requests to intervene must be filed by October 3, 2016. On Feb. 27, 2017, the Canadian Nuclear Safety Commission (CNSC) announced its decision to renew Cameco Corporation's nuclear fuel facility operating licence for the Port Hope Conversion Facility (PHCF) for a 10-year period. Following a two-day public hearing (November 3, 2011, and January 18 and 19, 2012), the Canadian Nuclear Safety Commission (CNSC) announced on Feb. 29, 2012, its decision to renew for a period of five years the Nuclear Fuel Facility Operating Licence for Cameco Corporation’s Port Hope Conversion Facility located in Port Hope, Ontario. The licence will be valid from March 1, 2012 to February 28, 2017. Cameco has submitted several technical studies and reports to the Canadian Nuclear Safety Commission (CNSC) and other regulators, which provide important information on matters of local interest pertaining to the Port Hope conversion facility. a plan to establish action levels for the fenceline gamma monitoring stations around the facility , July 10, 2009 (58k PDF). The Canadian Environmental Assessment Agency (CEAA) invites the public to comment on the Comprehensive Study Report for the proposed Vision 2010 Redevelopment Project for Cameco Corporation's Port Hope Conversion Facility located in Ontario. Written comments must be submitted by July 25, 2012.
additions or modifications to existing buildings with associated landscaping and infrastructure. The Commission has determined that a public hearing is not necessary to consider Cameco's request in this case. On Sep. 22, 2011, the Canadian Nuclear Safety Commission (CNSC) invited public comment on the Environmental Assessment (EA) draft Comprehensive Study Report (CSR) for Cameco Corporation's (Cameco) proposed Redevelopment of the Port Hope Conversion Facility (Vision 2010). The draft report is not available online. The public comment period runs to October 22, 2011. > View CNSC Request for Public Comment Sep. 22, 2011 . On March 7, 2011, CEAA announced that the document entitled "Draft, Cameco Vision 2010: Environmental Impact Statement: Port Hope Conversion Facility, December 2010" is available on request. On Nov. 3, 2010, the Canadian Environmental Assessment Agency (CEAA) announced that it is making available an additional $10,000 under its Participant Funding Program to assist groups or individuals to participate in the environmental assessment of the proposed Vision 2010 Redevelopment Project for Cameco Corporation's Port Hope Conversion Facility in Ontario. Funding applications received by the Agency by December 6, 2010 will be considered. On March 24, 2009, the Canadian Nuclear Safety Commission (CNSC) announced that it will move forward with an environmental assessment (EA) for Cameco's Vision 2010 project to clean up and redevelop its conversion facility in Port Hope, Ontario. In a letter to the Canadian Nuclear Safety Commission (CNSC), Cameco Corporation (Cameco) proposed the "Vision 2010" project, which involves a comprehensive redevelopment of its Port Hope Conversion Facility located in Port Hope, Ontario. The project consists of decommissioning and demolishing approximately 20 old or underutilized buildings, removing contaminated soils, building materials and stored historical wastes, and constructing new replacement buildings. On-site plant operations would be maintained while the works are being carried out. The Canadian Nuclear Safety Commission (CNSC) invites public comment on the draft Environmental Assessment (EA) Guidelines for the project. The public comment period closes on April 11, 2008. The Canadian Environmental Assessment Agency (CEAA) is making available $40,000 under its participant funding program to assist groups and/or individuals to take part in the environmental assessment of this proposed project. Funding applications received by the Agency by April 11, 2008 will be considered. The Canadian Nuclear Safety Commission (CNSC) will hold a one-day public hearing (November 6, 2008 - date revised) to consider the Environmental Assessment Track Report (Track Report) regarding Cameco Corporation's (Cameco) proposal for the Vision 2010 project, which involves a comprehensive redevelopment of its Port Hope Conversion Facility located in Port Hope, Ontario. The Commission will also consider the Proposed Environmental Assessment Guidelines (EA Guidelines). Requests to intervene must be filed by September 8, 2008. On December 8, 2008, the Canadian Nuclear Safety Commission (CNSC) announced its decision to recommend to the federal Minister of the Environment that the environmental assessment of Cameco Corporation's proposed Vision 2010 Project to redevelop its Port Hope Conversion Facility located in Port Hope, Ontario be continued as a comprehensive study. The Minister of the Environment must now decide on this recommendation. The Canadian Nuclear Safety Commission (CNSC) held a one-day public hearing (September 13, 2007) on the application by Cameco Corporation for acceptance of the proposed amendment to the value of its existing financial guarantee for its nuclear conversion facility located in Port Hope, Ontario. On Feb. 26, 2007, the Canadian Nuclear Safety Commission (CNSC), after holding a two-day public hearing (October 4, 2006 and November 28 and 29, 2006) issued a renewal for Cameco Corporation's operating licence for the Port Hope Nuclear Fuel Facility, located in Port Hope, Ontario. The Canadian Nuclear Safety Commission (CNSC), after holding a two-day public hearing, issued a 5-year license renewal for Cameco Corporation of Saskatoon, Saskatchewan to operate its uranium processing facility in Port Hope, Ontario. "Commission Member Dr. C. R. Barnes concurred with the other Members that the licensee meets the requirements of section 24(4) of the NSCA and therefore that a licence should be issued. On December 16, 1999, the Atomic Energy Control Board (AECB) approved the license renewal for the Cameco Corporation uranium conversion facility in Port Hope, Ontario. During the 1940's to 1960's, the Port Hope fuel facility caused massive releases of contaminants into the enviroment. In the Mill Street/ Madison Street area located south-east to the facility, the Ontario MOE found a uranium concentration of 135 ppm in 1986. The concentration had decreased to 40 ppm in 1997 (AECB BMD 00-29, Feb. 1, 2000). Respirable uranium particulate in air is being monitored at three locations around the Port Hope fuel facility since 1998. The highest average monitored at one of these stations was 0.0074 µg/m3 (AECB BMD 99-123, Sep. 21, 1999). The corresponding radiation dose from inhalation can be calculated at 0.013 mSv/a. At the request of the Port Hope Community Health Concerns Committee (PHCHCC), AECB has ordered a cancer incidence study in Port Hope from Health Canada. PNCHCC has requested further studies by independent researchers. (AECB BMD 00-30, Jan. 31, 2000). The Health Canada study was released on August 22, 2000. It has found that the overall cancer rates in the town of Port Hope, Ontario are comparable to rates throughout the Province of Ontario. "The cancer findings are, on the whole, consistent with the earlier cancer incidence report and previous Port Hope studies. The patterns of cancer mortality in Port Hope are comparable to the province of Ontario as a whole. This pattern is consistent with existing knowledge of doseresponse relationships of radiation risk that an observable excess of cancer wound not be expected because the cumulative doses in Port Hope were low (Tracey 1995, ICRP-60, Boice 1996)." These findings were discussed at the Commission meeting on June 27, 2002. On April 15, 2009 , the Canadian Nuclear Safety Commission (CNSC) released a synthesis report that indicates that the health of Port Hope residents is not at risk and is consistent with the health of the general population of Ontario and Canada. On Sep. 6, 2017, the Canadian Nuclear Safety Commission (CNSC) has issued an administrative monetary penalty (AMP) to Cameco Corporation (Cameco) in the amount of $17,830. In May 2017, CNSC staff conducted an inspection at Cameco's Port Hope Conversion Facility (PHCF) and found that Cameco had failed to verify that work was being performed correctly and according to approved procedures as required by Cameco's PHCF licence conditions handbook. On May 22, 2018, upon Cameco's request to review the violation, CNSC issued a Record of Determination with Reasons confirming the violation. Analysis of cooling water discharge on Oct. 7, 2014, indicated that the north discharge did not meet the toxicity requirement for Daphnia magna (water fleas). The testing on rainbow trout passed the toxicity requirement. CNSC staff received notification from Cameco on January 29th, 2014, about an incident which required Cameco to perform a manual shutdown to a critical process for uranium hexafluoride (UF6) conversion. This manual shutdown was necessary due to a potentially unsafe valve configuration required to maintain a safe working condition within the facility. On February 10, 2014, the CNSC permitted Cameco to restart the facility. There have been several incidents of "exceedances" and spills at Cameco over the last few months and Rebecca Peters, superintendent, compliance and licensing for Cameco's Port Hope conversion facility, says the company is looking into them. She reported that besides the two earlier reports of Freon leaks in July, there have been several others since then. She told council that in August there was a hydrofluoric acid leak inside the loading area of the HF Building, but that the area is sealed and the leak was contained within the sealed area. Then, in early September, a uranium hexafluoride (UF6) leak occurred in the flame reactor area, but once again the barriers worked and the leak was contained inside the building. Shortly after that incident, Cameco exceeded the allowable municipal limits in the sanitary sewers for pH. Peters said they were transferring condensate via a hose and discovered a pinhole leak in the hose near the sanitary sewer system. Just last week Cameco received the report on elevated lime candle readings for the month of September, but has yet to analyze it. Peters said the daily and weekly readings did not show any significantly high results, so they will be investigating why the monthly reading was higher. Cameco senior communications specialist Doug Prendergast said the fluoride levels read 58, when the allowable limit is 40 - but this is only during the growth period for vegetation. On May 19, 2009, Cameco Corporation announced that it is preparing to resume uranium hexafluoride (UF6) production at its Port Hope conversion facility. Cameco has signed a new contract with its historic supplier of hydrofluoric acid (HF). UF6 production is expected to resume early in the third quarter of 2009. On June 17, 2009, Cameco Corporation announced that it has resumed production of uranium hexafluoride (UF6) at its Port Hope, Ontario conversion facility. On July 20, 2007, Cameco Corporation reported that during a construction project it discovered uranium and evidence of other production-associated chemicals in the soil beneath its Port Hope uranium hexafluoride (UF6) conversion plant. The affected area "appears to be" within, and near, the perimeter walls of the UF6 plant based on the preliminary information available at this time. The chemicals are in a contained area so public health and worker safety are not affected. Due to the nature of soil at the plant, Cameco expects the ground water flow rate, with the chemicals, to average approximately 40 to 60 metres each year. The perimeter of the plant is about 70 metres from the edge of the property. Cameco has monitoring wells around the property to detect chemicals in the area. These wells are checked quarterly and reported to the regulator annually. The last scheduled samples were taken in April and did not indicate potential issues. Cameco has arranged for additional samples to be taken. Cameco has suspended operations at the UF6 conversion plant, and full production of UF6 will likely be suspended for a minimum of two months until Cameco has determined the source of the chemicals and developed appropriate plans. On Oct. 3, 2007, Cameco reported that groundwater test results from a new monitoring well indicate slightly elevated levels of uranium and arsenic at a location eight metres inside the fenceline south of the UF6 production building. This is the first indication that contamination may be present beyond the property line. The monitoring system does not detect deterioration of and/or leakage from the 'floors, sumps & trenches'. On Jan. 28, 2008, Cameco Corporation reported it has received regulatory approval to begin repairing and upgrading the Port Hope uranium hexafluoride (UF6) conversion plant following the discovery of soil contamination beneath the facility. UF6 plant operations have been suspended since the discovery in July 2007. Cameco has set a target of resuming UF6 production in the third quarter of 2008 at the earliest. The estimate for the cleanup of the contaminated soil at Port Hope has been increased to C$15 to C$20 million from the C$3 million previously recorded due to an increase in the scope of work required to remediate the contaminated areas. In addition, Cameco expects to spend C$20 to C$25 million on plant improvements. On Sep. 16, 2008, Cameco announced that CNSC staff has accepted Cameco's plans to restart UF6 production. The restart is expected to happen within the next several days. On September 30, 2008, Cameco Corporation announced that it has resumed production of uranium hexafluoride (UF6) at its Port Hope conversion facility. Cameco voluntarily halted production in July 2007 and indicated recently that the company had resolved the issues that led to the presence of uranium and other production-related chemicals beneath the plant. On June 29, 2010, Cameco notified the Canadian Nuclear Safety Commission (CNSC), that it had potentially exceeded an Action Level for uranium emissions from its UO2 plant in Port Hope, Ontario. On June 30, 2010 Cameco voluntarily shut down the UO2 plant to conduct their investigation to determine potential sources of elevated uranium emissions. On July 12, 2010, Cameco submitted its report on uranium emissions from its UO2 plant main stack. 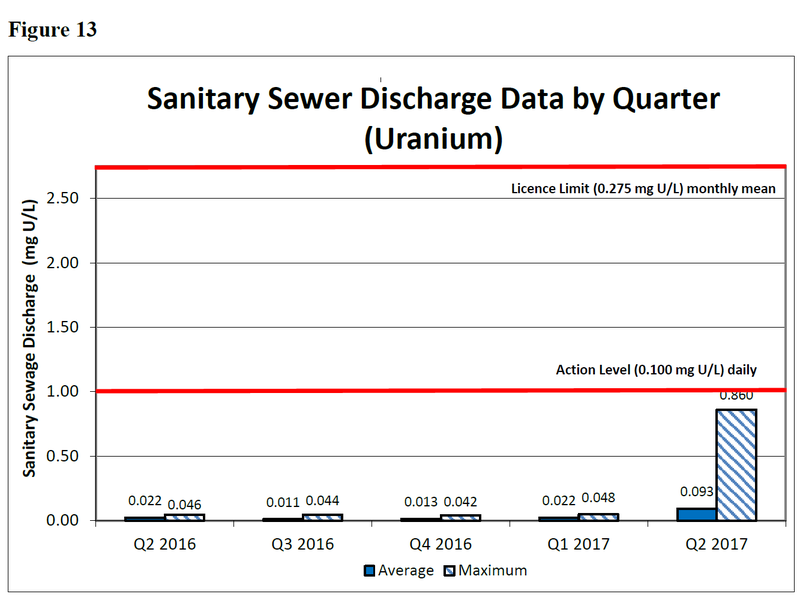 Based on the review of this report, the CNSC has determined that on June 29 the UO2 plant uranium emission rate was 7.21 gU/h (grams of uranium emissions per hour). Although this rate is well below the licensed limit of 150 gU/h, it is above the plant's Action Level of 7 gU/h. The CNSC has asked that Cameco submit its final investigation report, including the causes of elevated uranium emissions and the corrective actions that will be taken to prevent reoccurrence of the June 29 incident. On Sep. 23, 2005, the Canadian Nuclear Safety Commission (CNSC) canceled a one-day public hearing scheduled for October 20, 2005, to consider the results of an Environmental Assessment Screening (EA Screening) of Cameco Corporation's (Cameco) proposal to produce commercial quantities of blended slightly enriched uranium dioxide (SEU), to process scrap in a scrap recovery circuit, and to produce blended dysprosium oxide and natural uranium dioxide (BDU) at its facility located in Port Hope, Ontario. The Canadian Nuclear Safety Commission (CNSC) invites public comment on the Draft Screening Report concerning the Environmental Assessment of Cameco's proposal to blend slightly enriched uranium (SEU), blend dysprosium uranium (BDU) and operate a scrap recovery circuit at its conversion facility in Port Hope, Ontario. The Canadian Nuclear Safety Commission (CNSC), after holding a one-day public hearing on November 27, 2003, approved the Environmental Assessment Guidelines (EA Guidelines) for the proposed blending of Slightly Enriched Uranium (SEU) and Blended Dysprosium Uranium (BDU) at the Cameco Corporation Conversion Facility in Port Hope, Ontario. The Canadian Nuclear Safety Commission (CNSC) invites public comment on the draft environmental assessment guidelines for the proposed blending of Slightly Enriched Uranium (SEU) and Blended Dysprosium Uranium (BDU) at the Cameco Corporation Conversion Facility in Port Hope, Ontario. 2 million litres of this solution contain up to 20 kg of uranium. The Canadian Nuclear Safety Commission (CNSC) will hold a one-day public hearing (September 27, 2011) to consider Atomic Energy of Canada Limited (AECL)'s application for a licence for the Port Hope Area Initiative Port Granby Project. AECL is seeking a ten-year licence term to develop the new Long-Term Low-Level Radioactive Waste Facility and to complete the remediation of the existing Port Granby Waste Management Facility. The Port Granby Project intends on providing for the management of low-level radioactive waste currently located in Clarington, Ontario. Requests to intervene must be filed by August 29, 2011. Following a hearing held on August 17, 2009 in Ottawa, Ontario, the Canadian Nuclear Safety Commission (CNSC) announced today its decision that the Low-Level Radioactive Waste Management Office's (LLRMWO) proposed project to construct and operate the Port Granby long-term low-level radioactive waste management facility in the municipality of Clarington is not likely to cause significant adverse environmental effects, taking into account mitigation measures identified in the Environmental Assessment Screening Report. The Commission can therefore proceed, under the Nuclear Safety and Control Act, with its consideration of a licence application from the LLRWMO for the proposed project. Natural Resources Canada and the Canadian Nuclear Safety Commission invite comments on the draft screening report for the proposed Port Granby Long-Term Low-Level Radioactive Waste Management Project. The public comment period for the Port Granby Project draft screening report will end on June 17, 2009. The environmental group Lake Ontario Keeper raises concerns about toxic waste leaking from the Port Granby waste management facility into Lake Ontario. The Port Granby facility, located 15 km west of Port Hope, is holding wastes from the Port Hope uranium conversion plant.